It would be grossly unfair to single out France as a world champion of nasty nutrition. Far from it: sheeps’ eyeballs in Arabia, deep-fried crickets in south-east Asia, even guinea pigs in South America, could all knock France into a cocked hat when it comes to sources of food I would run a mile from. As for bush tucker, let’s not even go there (if a witchety grub tastes like scrambled eggs, why not just have scrambled eggs?). It’s also only right to point out that Brits too eat some strange stuff. Haggis and faggots may be comparatively mainstream, but what sort of message about the Anglo-Saxon way of life is the 3 a.m. doner supposed to convey? I don’t think I’m particularly squeamish about food, but there again I wouldn’t categorise myself as especially adventurous either. Lamb, pork and beef are all perfectly fine but I wouldn’t go out of my way to eat horse meat (even if Tesco gave me a choice). On the other hand, I’m quite partial to rabbit and venison, which many of my countrymen refuse to countenance. Walt Disney has a lot to answer for. A greater degree of selectivity needs to be applied when it comes to specific internal organs and bits. It’s quite common here to see cows’ tongues displayed at butcheries (although it’s not a pretty sight) and, while I can remember in my youth having sliced pressed tongue on sandwiches without raising any objection, I can’t envisage a whole one ever featuring on the Sunday roast rota here at Tranquility Base. On the other hand, lambs’ hearts are greatly underrated, in my view. One of the most delicious meals I ever had was thinly sliced ox liver seared on a barbecue. I would draw the line at foie gras, however, not just for ethical reasons but because, although I have tried it, I don’t enjoy the feeling of my arteries furring up even as I eat it. I have no interest in tripe or sweetbreads, but the occasional plate of rognons doesn’t come amiss. I ate brains once, but it was a mistake (and a long story). Over the piece, therefore, if it was a match between me and offal, I’d probably call it a score draw. However, I recently encountered a concoction which is so egregiously revolting – in both conception and execution – that I do seriously wonder whether it is meant to be some kind of private joke, a major hoax perpetrated by the French nation on Jean l’étranger. 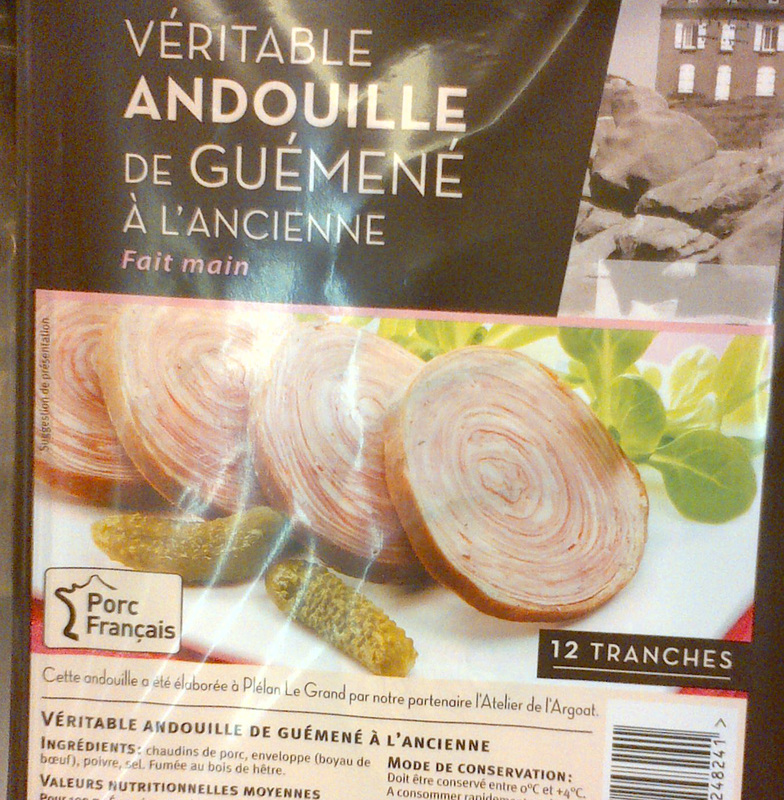 ‘Véritable Andouille De Guémené’ it said on the packet, which wasn’t particularly informative. ‘Chaudins de porc’, listed as the main ingredient, didn’t help much either. It looked like thin slices cut from a tightly-packed onion. If you baulk at the prospect of having to read that all the way through again, let me just repeat the key words: ‘thirty large intestines…pickled in brine…inserted in a cow bladder…cooked…flavoured with hay…left to dry’. Really? Sorry, no. I will never, ever be that hungry.